The French EnhanserTM Press is an extruder used to pelletize oil-bearing seeds or pre-press cake to provide an ideal medium for solvent extraction. As pellets discharge from the die plate of the Enhanser Press, they expand and flash off moisture. This creates dense pellets with a vast matrix of open-structured, internal solvent passages. These pellets yield much better extraction results than flakes or pre-press cake. Two-piece, flanged barrel allows the discharge end to be removed in case of a plug, and when worn, the worn section can be replaced rather than replacing the entire barrel. Individual keyed shaft parts at the discharge end can easily be removed for replacement or repair. Seals are replaceable without tearing down unit. Four injection ports are included with each press for the injection of steam directly into the barrel of the unit. These valves can be positioned anywhere along the length of the barrel and at any of the three positions around the circumference of the barrel. A single row, tapered roller bearing and a spherical roller thrust bearing combination is used to reduce the chance of fatigue failure of the main shaft. Mechanical tubing is used for the barrel, rather than using a thin tube and welding strips of metal to it, to provide enough wall thickness for installation of the breaker pins and injection valves. 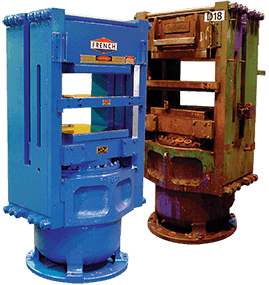 Optional gearbox driven units are available for high-horsepower applications. The die plate accepts 24 and 36 inserts (for 8″ and 10″ models respectively), which can be of various shapes and diameters to fit your specific application and to provide a pellet with the best extraction characteristics.